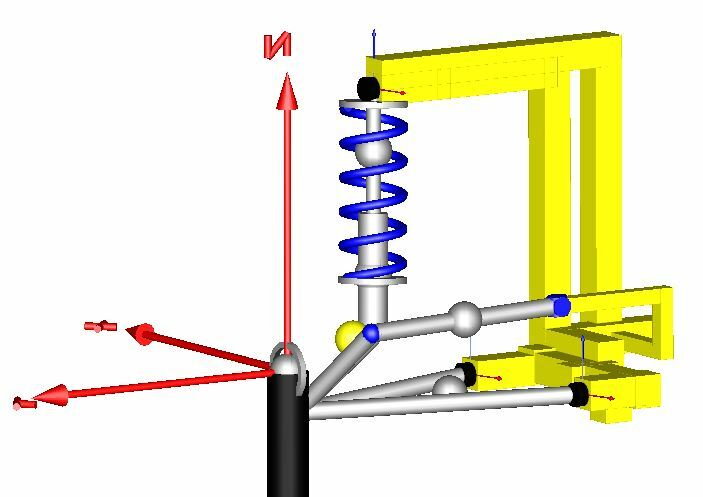 Focused on the optimisation and analysis of automotive and on-road vehicles, where the basic vehicle layout is that of a pair of independent linkages connected by an anti-roll bar, the Suspensions library provides the user with a turn-key solution to detailed vehicle dynamic analysis. 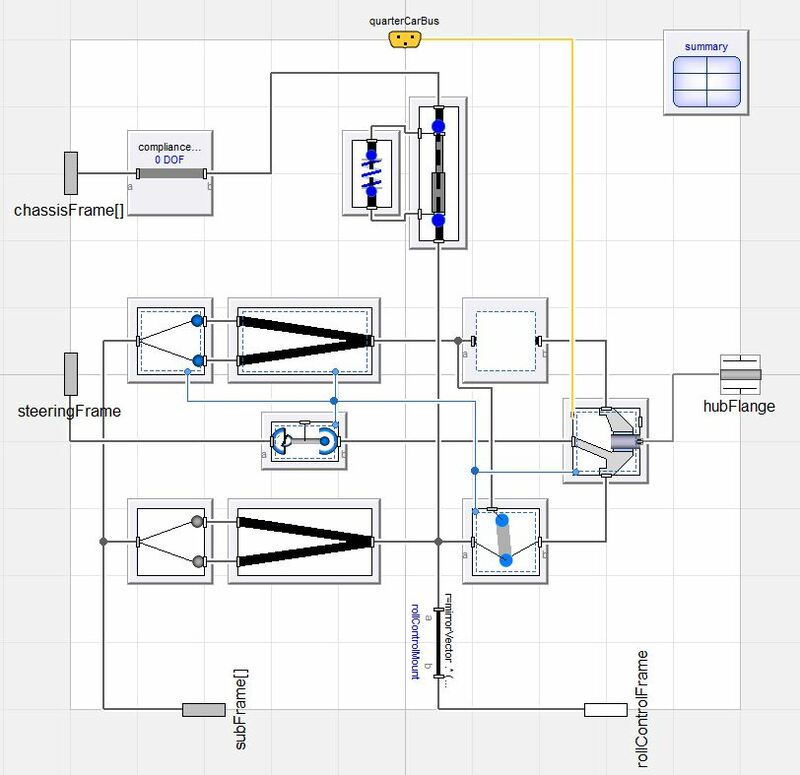 The core of the Suspensions library is multiple multibody steered/non-steered independent linkage models of various layouts and configurations, built to be easily parameterised and integrated into a vehicle model. Further detail can be provided by lumped compliance blocks and mounting bushes, enabling kinematic and compliance (K&C) effects to be captured and included in a full vehicle model. The same principle extends to anti-roll bar models, with an array of options available to model various mounting scenarios. Common steering mechanisms rack and pinion and pitman arm, are available with various power assistance and manual options. Moving beyond linkages, a full vehicle dynamic analysis suite is provided by detailed road models, encompassing both high-frequency/low-amplitude road roughness and low-frequency/high-amplitude curbs. Undulations and camber are also included. Flat/smooth road models are utilised for rig tests with wheel patched, whilst specifically designed actuators can be employed to simulate a full vehicle K&C experiment. Tyre models available include Pacejka MF 6.1/6.2 models, with F-Tyre supported as well as the option for multi-threading available. Closed and open-loop driver models complete the library, enabling the user to understand vehicle dynamics and handling performance in a repeatable virtual test environment. To facilitate the development of real-time models, all suspension linkages featured in the Suspensions library have been optimised for performance. Care has been taken to ensure the state selection strategy used in each linkage model provides the fastest possible simulation speed with no dynamic states within the model. Beyond this, the Suspensions library features innovative aggregate joint models, which are specifically designed idealised joints for real-time applications. Featuring a different concept of force and angle calculation, aggregate joints are more efficient computationally than standard multibody joints. Also included in the library is the ability to map a multibody suspension linkage and generate a table based approximation. A full complement of data collection experiments alongside the relevant harvesting functions means the process is as simple as designating the desired linkage model to be mapped, setting output data parameters and clicking execute. Due to the shared parentage with the VeSyMA library, any vehicle model built from the Suspensions library is compatible with the real-time simulator templates found in the Driver-in-the-Loop (DiL) library. In addition to the compliment of ideal multibody linkages, examples of non-linear compliant and bushed linkages models are also provided. As the linkage model templates have been designed to support both ideal joints and bushed joints in addition to rigid and linear compliance blocks, any linkage model can be fashioned into compliant linkages. Linear, non-linear and frequency dependent bushes are available in the Suspensions library with a built-in preload tuner, which calculates the preload forces for the bushes to ensure the linkage model the bush is used within initialises with no deflection in the bushes beyond a tolerance the user sets in the tuning process. 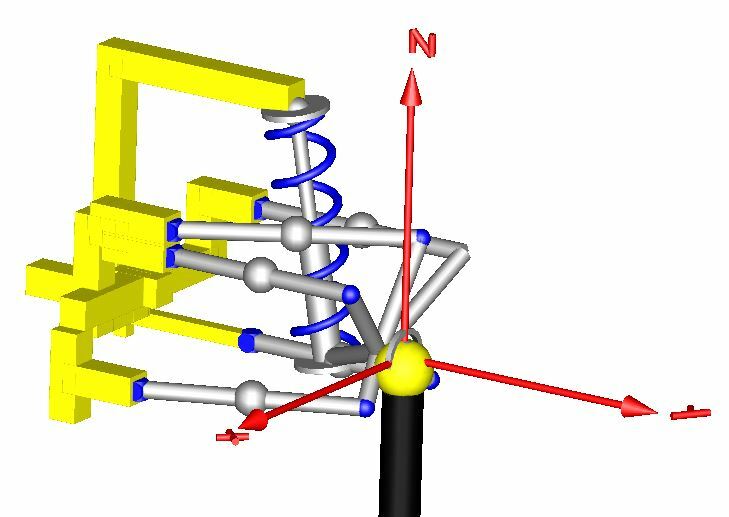 Linkage compliance is lumped in the arm mounting and strut mounting points, to enable kinematic and compliance (K&C) effects to be captured. A range of compliance blocks are available for use, ranging from single degree of freedom translational or rotational to full 6 DOF blocks. Both standard compliance blocks using spring dampers, and more computationally efficient quasi-static versions are available.